You see them on cars and trucks everywhere. A large number of the vehicles in the church parking lot may have them displayed on bumpers and rear windows. It is a symbol that resembles the outline of a fish. Do these symbols identify the driver as a fisherman or fisherwoman? Does he or she worship fish for some reason? What is this symbol and where did it come from? Let us investigate a bit further. My research, albeit brief, revealed that the history of this symbol is scarce, mostly conjecture. The New International Dictionary of the Christian Church says this concerning the use of the fish symbol as a symbol for Christianity, “Neither is it known how early this usage developed” (p. 377). We know that it represents Christianity now, but one would have to consult ancient primary sources for more information, if it even exists. Therefore, this article is mostly based on the popular opinions passed down from age to age. The Greek word for ‘fish’ is ‘ichthus’ (transliterated from the Greek). The early Christians formed an acrostic from these letters as follows: I= Iesous (Jesus); CH=Christos (Christ); TH=Theous (God); U= UIOS (Son); SOTER (Savior). Therefore, the idea of the fish, or the sight of the symbol, would immediately bring to the believer’s mind the good news of Jesus Christ. Combined with the fact that, during Jesus’ ministry, He referred to His disciples as “fishers of men” (Matthew 4:19; Mark 1:17) and He fed huge groups of His followers meals of fish (Matthew 14:13-21, 15:33-39; and parallel accounts), the fish was an excellent choice to represent the followers of Jesus. The fish symbol was a way Christians could identify themselves to each other without either the government or the religious leaders recognizing them. The early Christians were persecuted by both the government and religious leaders of their day. Roman emperors often regarded themselves as gods and demanded that the people worship them as such. Therefore, this Christian religion, which worshiped Jesus Christ, was a threat to these emperors and their rule. These believers in Christ had to keep their beliefs hidden from the government because of this. The Jews also believed that these Christians were worshiping a false god. Because Christians followed Jesus Christ, the Jewish religious leaders sought to squash what they believed to be a new, and blasphemous, religion. Hence, Christians had to hide the fact that they were followers of Christ from the Jewish leaders too. The fish symbol was a way Christians could identify themselves to each other without either the government or the religious leaders recognizing them. Upon meeting someone new, a believer would draw half of the fish symbol in the dirt and the other person would either complete the other half of the symbol, thus revealing himself or herself as a Christian, or not recognize the action of the believer, thus revealing himself or herself as not being a believer. Since the non-believer did not recognize the believer’s actions, the believer’s religious beliefs could remain safely hidden. The fish symbol’s importance in the United States seems to be more decorative than anything else. American Christians do not fear that we will be put to death or imprisoned for our faith, at least not yet, so the symbol stuck to cars and other objects serves to identify the user as a believer in Jesus Christ. A word of caution for those who are just learning about this symbol. First, one is not a Christian simply by sporting a symbol of a fish on his or her car. One is a Christian if one has recognized that he or she is a sinner, repented of that sinfulness, and committed his or her life to Jesus Christ. A life lived out for Jesus is a much better witness than a plastic fish on one’s car. Secondly, be sure to look closely at any fish symbol you noticed in public. There are several parodies and mockeries of it in existence. Evolutionists, pastafarians (a parody religion that pretends to worship pasta), and even Trekkies (avid fans of Star Trek) have molded the Christian fish symbol to represent their interests. Just because you see a fish symbol on someone’s vehicle does not mean they are your spiritual brother or sister in Christ. The common fish symbol seen on cars, and other places, is a symbol of Christianity. It was initially designed to allow Christians to identify each other while, at the same time, preventing those hostile to Christianity from identifying believers. Today, in America, one can display the symbol without fear of persecution from the government. 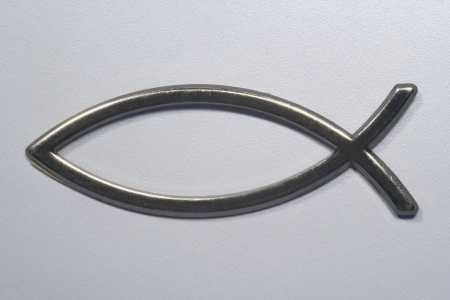 The Christian fish symbol should be displayed to remind the Christian to be a faithful follower of Jesus Christ, to show other Christians that they are not alone, and to challenge non-believers to consider the claims of Christianity. The New International Dictionary of the Christian Church. J. D. Douglas, ed. Zondervan Publishing Co. 1978. Yes you are quite right about the fish. St Peter was a fisherman,and all the people living around the district would know what the fish sign meant. It`s so simple that the Romans would not evan think about it that it was used to let each christian know what was being taught and said amons`t christians. Please could you find out or post up what did the fish symbol have to have on its face to show it was safe to go in? give a man 2 fish, feed him for a day. teach a man 2 fish(to fish), he feeds himself for a lifetime. what are the 2 fish then? in my mind hear the pink floyd song wish you were here, 2 lost souls swimming in a fish bowl year after year. the 2 lost souls are the 2 fish, the fish bowl our physical body. the water our minds body, and the fish the spirit body. the fish are also our polarities like masc/femin, good/evil, god/devil, me/you, all seen dualistically. when we have not found our inner union, we feel like lost souls stuck in a body, swimming circles with no changes or end on sight. when you teach a man 2 fish, he feeds himself for life. and if that mans two fish finally find union as one fish, as in the singular fish we see for christ, this man is ready to teach fisher men, just as jesus did. its a beautiful thing, jesus’ light is passed on from fisherman to fisherman, as soon as man gets tired of the struggling to survive/eat daily and seeks a better way to sustain, these talks of fish and divine unity fall upon def ears of happy bellys.